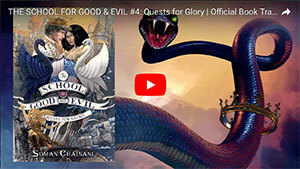 The New York Times bestselling The School for Good and Evil is an epic journey into a dazzling new world, where the only way out of a fairy tale is to live through one. Start here to follow Sophie, Agatha, and everyone at school from the beginning! I absolutely love this book, it is great with that big fairy tale twist, I should know I've read all of them, they are the best. 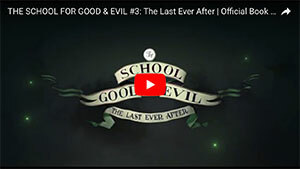 Two best friends one evil one good then the evil one ends up at the school for good and the good one ends up in the school for evil and they think they are at the wrong schools only to find out that they were at the right schools all along. This book was amazing!!!! It is an epic battle of two used-to-be best friends. One wants to be in the School for Good, but goes to the School for Evil, and the other one vise-virsa. not done with the book yet but I am hooked. Im finished this on the date of March 13, 2019. I am in 5th grade, and I LOVED IT! The compelling story, strange plot-twists, and the fact that it hooks you at the first sentence! Every 4 years two 2 children are stolen away from gavaldon, never to return. Most children fear of being taken to the school for good and evil. But not sophie.... my thoughts on this book are I love it, i like the part with yubas lessons on the page and did I mention I loooovvvvveeee it? I love school for good and evil!!!!!!! I want the veerrryyy last one!!! That's the only one I haven't read!!!! I read this book in fifth grade. I finished the last book in re series last year after ingot it for Christmas. This is none of the best books ever! the first copy i got of the book was gifted to me from my school. I'm elementary school, there was a thing where we all got to choose one book to keep from schoolastic, that was the book I chose. I thoroughly enjoyed this book and recommend it to people above grade five. This is an amazing book! Sophie is the practical image of perfect princess. And Agatha is a witch, no questions asked. But readers are mistaken. At first it might appear the best friends were taken to the wrong school because of their quarrell while being carried by large skeletal birds. Agatha was brought to the crisp clean castle with girls in large colorfu gowns and boys with shining swords. Agatha was not pleased. . Sophie was mortified. She was brought to a room with girls that scared her and then took classes that she somehow thrived in. Both girls franticly tried to go to the school of their choice but both fell into the arms of the dashing Tedros, son of King Arthur. Agatha had won his heart making Sophie go wild. She turned into witch nearly destroying the schools. Can Agatha and her prince save the day, or will her "Happily Ever After" never come true?